Describing great Scrum is very simple, while doing great Scrum is very hard. What’s the problem here? The problem boils down to ONE WORD: “authority”. Teams in Scrum are granted a substantial increase in authority when compared to other ways of working. Scrum co-creators Jeff Sutherland and Ken Schwaber bristle when you describe Scrum as a “methodology”, or a “process”. They say it is a “framework”….but what kind of framework is it exactly? Answer: It is an AUTHORITY framework, where each Scrum role is granted specific authority. These powers do not overlap across the Scrum roles. The authority of each role is very clear. You’ll understand how to create a great Scrum implementation by paying careful attention to adhere to Scrum’s clearly specified authority structure. We’ll explore the concepts, do some enlightening exercises, and help you pinpoint exactly where you need to pay close attention in your own Scrum implementation. Dan Mezick is a trusted adviser to executives, project sponsors, managers and teams developing complex products using Agile and Scrum. Dan’s firm, New Technology Solutions delivers Agile training, coaching and consulting to businesses of all sizes. Clients include The Hartford Insurance companies, Siemens Corporation, Sikorsky Aircraft and dozens of mid-market organizations. Dan is the author of books from McGraw Hill and is a software patent holder. 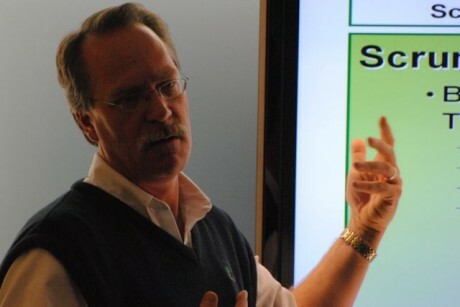 His articles on Agile and Scrum appear on the pages Agile Journal and the Scrum Alliance web sites. His is a writer at InfoQ with dozens of articles published on agile & Scrum topics. Dan led the Manifesting Agility Stage of the Agile2009 conference and is a past presenter at the Agile2008 and Agile2007 conference events. Dan organizes and convenes the meetings of Agile Boston, a regional Agile community of practice with over 1200 members. One of the largest Agile user groups in the USA, Agile Boston convenes monthly meetings of up to 100 attending. The group periodically arranges larger 1-day events of up to 275 attendees.